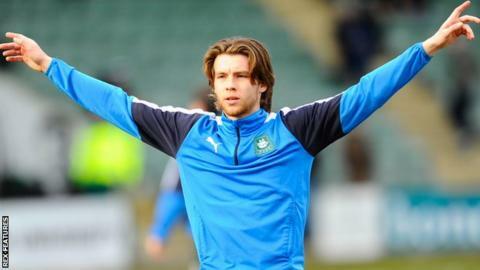 Plymouth Argyle manager Derek Adams has challenged striker Tyler Harvey to step up and compete for a first-team place. He was recently recalled from a loan spell with National League South side Bath, after an injury to Reuben Reid. "He's come back in a confident frame of mind, he's got games and scored goals," Adams told BBC Radio Devon. "He has to be better than the other players in his position, he's only 20 but he's got to be better than Jamille Matt, Reuben Reid and Ryan Brunt." Harvey scored four goals in five appearances for Bath, and Adams confirmed he will be in the Pilgrims squad for their trip to promotion rivals Portsmouth on Saturday. Meanwhile, on-loan forward Daniel Nardiello is currently back training with parent club Bury, having not featured since early March. "Unfortunately for Daniel he's the sixth man at this moment (only five loan players can be named in a matchday squad), but that might change from now until the end of the season," Adams added. "He's training at Bury at this moment because that was the best solution to the problem, and from my point of view he wasn't going to be involved in the 18-man squad. "It gives him time to train with them, but he's still our player."